sive is found deep in the sweltering expanses of the Rub‘ Al-Khali, in a nondescript sabkha (dry lake bed), known as Shaybah. The year is 1951. It has been less than 20 years since the Kingdom of Saudi Arabia signed an agreement with Standard Oil of California to explore for oil within the country. The first teams of geologists have been sent out to the Rub’ Al-Khali, taking on the seemingly impossible task of searching through 650,000 square kilometers of desert in hopes of finding oil. eastern corner of the desert, holding reserves — as would later be learned — of more than 18.9 billion barrels of Arabian Extra Light crude oil and 25 trillion standard cubic feet of natural gas. Fast forward to the 1970s. Attempts are made to develop Shaybah, but such a venture proves to be too expensive and beyond the capabilities of available technologies. ing, the time is right, and the stage is set. Saudi Aramco initiates the project to gather, treat and transport oil from Shaybah to Abqaiq plants. Less than a year of planning later, construction begins with the vital 386-kilometer access road between the border town of Selwa and the Shaybah site. Once completed, travel between Dhahran and Shaybah — a journey of nearly 800 kilometers — is cut down from four days to a mere 12 hours. Over the next year and a half, giant trucks carry seemingly impossible loads across the desert in a constant stream of materials, equipment and manpower. As endless tons of material, pipes, concrete, sand and steel are delivered to this empty sabkha, thousands of men dedicate 50 million hours to bringing the facility to life. The industrial complex begins to take shape. The main facilities include three gas-oil separation plants (GOSPs) and a gas compression plant, several utilities plants and control rooms, along with an airstrip, living quarters, and two links between Shaybah and Abqaiq: A 650-kilometer fiber-optic communications cable and a 630-kilometer pipeline to transport oil. cient oil-production facility for the country and a vital provider of energy for the world. On March 10, 1999, then-Crown Prince Abdullah ibn Abdulaziz Al-Saud inaugurates the Shaybah field in the first ceremony of its kind to take place in the Rub‘ Al-Khali. And that’s not all. 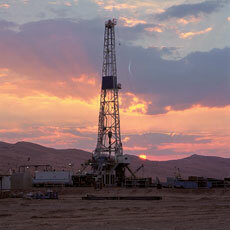 Saudi Aramco plans to end its 75th year by boosting Shaybah’s production by 250,000 barrels per day. There is already ongoing construction of a grass-roots facility comprising additional GOSPs, utilities plants and increased pipeline capacity, along with additional housing and support facilities. Shaybah has become a key element in the company’s 75 years of bringing prosperity to the Kingdom of Saudi Arabia and providing energy to the world. Oil. Energy. Perseverance. Over the past 75 years, these words have become synonymous with Saudi Aramco. Recently, a new word has entered that list. All around the world, word has spread of this modern industrial oasis. What makes Shaybah unique is that it has become a cultural icon of the company. More so than any other facility, it represents Saudi Aramco’s spirit of providing energy even in the harshest of environments and the most remote locations. Over the past few years, people from a wide spectrum of professions, associations, companies and countries have visited the facility to witness for themselves the quintessential Saudi Aramco success story. Visitors have included students from Harvard Business School and the MIT Energy Club; government officials such as US energy Secretary Samuel W. Bodman, Norwegian Petroleum and Energy Minister H.E. Einat Steensnaes, and Indian Petroleum and Natural Gas Minister Shri Mani Shankar Aiyar; leaders of countries including Philippine President Gloria Arroyo; oil-industry and energy experts such as Narendra Taneja, chief executive of the World Oil and Gas Assembly; and CEOs of the world’s largest oil companies. Their trips to Shaybah have left indelible impressions upon each person about the potential of Saudi Aramco and Saudi Arabia.